MEMBERS of Newland Concert Brass have celebrated after the band raised nearly £2,000 from a charity concert. 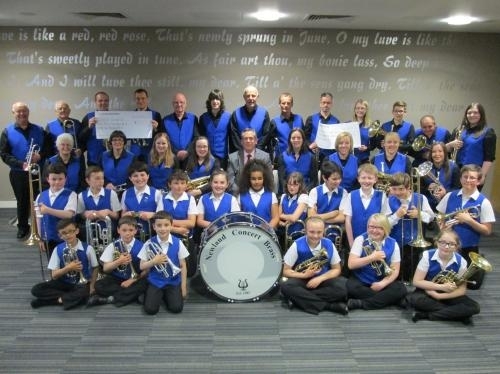 The event, in Bathgate's Regal Theatre, featured the organisation's senior and junior bands, guest conductor Mark Good and vocalist Blair Gibson in an evening of soundtracks from musicals and movies. A total of £1,890 was raised, with the funds due to be split equally between the British Heart Foundation and Spontaneous Coronary Artery Dissection (SCAD) Research Project in Leicester. The rare cardiac condition often strikes out of the blue, but unlike coronary heart disease (CHD) which is the UK's single biggest killer, it doesn't appear to be preventable. SCAD usually strikes between the ages of 19 and 64, with women making up 80 per cent of those with the condition. One example is Jennifer Heenan, who plays euphonium in Newland Concert Brass. Jennifer's twin sister Karen, principal cornet player with Newland Concert Brass, said: "We would like to thank everyone who helped support the concert. The money is going to two very worthwhile causes and we know it will make a huge difference. I was shocked when my sister suffered a heart attack caused by SCAD in November 2013, having had no warning signs or risk factors associated with heart disease such as high cholesterol. "We have since learned that this is the case with most SCAD survivors and although sadly some patients suffer long term damage and experience bypass surgery and heart failure, Jennifer is in fact one of the lucky ones who now only requires daily medication."